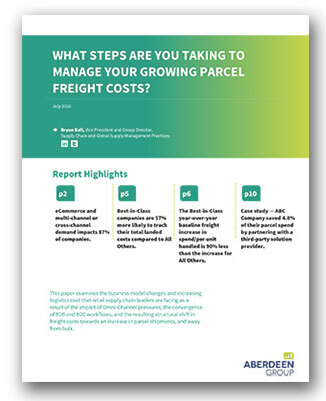 Aberdeen Research Report: "What Steps Are You Taking to Manage Your Growing Parcel Freight Costs?" This Aberdeen Report examines business model changes and increasing logistics costs that retail supply chain leaders are facing as a result of the impact of Omni-Channel pressures, the convergence of B2B and B2C workflows, and the resulting structural shift in freight costs towards an increase in parcel shipments, and away from bulk. Download the Aberdeen Report now.